I am going to post a daily blog for my students as we prep for the AP Exam. I thought some of you might be interested in following. It will be very specific to my classroom and the materials that I have. But if you're new to the course it might give you a window into one teacher's test-prep ebb and flow. I'm a little hesitant to share this, because this blog will continue some of my most honest test tips to my students. I've already had to admit once that I was lazy and taught them to say something that might end up costing them rubric points. But recently my friend John Stevens (@Jstevens009) reminded me that all teachers feel like they're still figuring things out. So I suppose that admitting my failings is a fine thing to make public. A note about my materials. I give my students a booklet with old AP FRQ's and MC. The FRQ's have the year on the problems, but to make life easier I labeled the problems. 1997 is test A, then test B for 1998 and so on. If you have any questions, feel free to drop me a line: jared@mrmathman.com. Yesterday I had a student raise her hand. She asked "Will there be a chance to raise our regression grade?" If you don't have your grading system broken down by standards or units, you are missing out on this kind of awesome. Let me explain. That is, remove your tests/quizzes/final/projects categories and replace them with the names of the units you will teach in a given semester. Yes, there is some messiness here. You might have to enter your final exam in four pieces. And you'll have to consider carefully how many points to makes quizzes vs. tests. And other conundrums. And, of course, this implies that you are going to pay attention to growth over time. And some how dive into your gradebook and give your students a fair grade that shows their growth over time. Not just average every score together no matter what. But won't that be worth it? Wouldn't you love it if a student was worried about their grade and instead of begging actually asked you how they could learn more about a specific topic? I'd say its more than worth it. My blog is woefully incomplete. I have posted my journey with Standards Based Grading. My last couple of posts discussed problems. But never any solutions. For what they're worth, here they are. The short description of how I manage to grade growth over time (which is the ultimate goal of Standards Based Grading) is to grade by Units instead of by Standards. To my friends who can keep track of 20 to 30 standards, more power to you! I can't do it. These are bigger than standards. But they are topics that are grouped in one to three chapters in my text (Stats Modeling the World). And I can mark most of my tests, quizzes, projects, etc... as being in one of these units. Here are some of the ways I have implemented this idea. Quiz scores are replaced with test scores. Quizzes are essentially formative in nature. When a student performs poorly on a quiz it is a signal that they need to study more for the upcoming test. If they do so and improve their understanding, then I think it is only fair if their quiz score is increased to match their test score. When a student is dissatisfied with their grade, we discuss which unit they have low scores. When I'm at my most organized, the gradebook is marked with a unit on each assignment so that students can identify this for themselves. Students come after school, do some practice work on this unit, and then (usually on a second day) take a reassessment. I often cap the reassessment at 80% because it was shorter and more focused than the full unit test. All students take a cumulative test. Sometimes I give a two day midterm. Other times I specifically tell students which extra unit will be added to the current unit test. And then if students show growth over time, their past scores are bumped up. My buffet test continues to be a favorite tool along these lines. How does all this happen in the gradebook? Not by any magic tool I've discovered! I make these changes manually. And often based on dialog with students. It's not perfect. But there it is. I think it is fair. And I've yet to find an easier method. I've also switched to total points, instead of weighted categories. In my school's gradebook, I can use total points, but still give assignments a tag. And students see their percentage for each of the tags. So the tags are my units. And if I have an assignment that is a mix of all sorts of units, I can just tag it as an "assignment" and I don't have to stress about it. So there it is. I like it. For today. For this year. Probably something different in the future, but right now this works for me. I've been thinking a lot lately about times when math teachers force students to do things without technology, or "by-hand" and then later (or perhaps never) show them later how they can do the procedure faster or more efficiently with technology. To illustrate my first point, I have to tell you what happened with me. And, as will be no surprise to anyone, this example centers around AP Stats. When I teach confidence intervals and hypothesis tests, I follow the same route that most AP Stat teachers follow. First students find the interval and the p-value by-hand. I don't show them that their calculator has a button for each of these functions that will do all the work for them. I do this, I tell myself, because it will help them remember everything that the calculator is doing in the background when they press these buttons. But here's my dilemma. About six weeks later, I challenge them to do the procedure, by-hand. I give them limited information so that they have to reconstruct the p-value in a different way then they have for most of the unit--eliminating the possibility that they can use the faster method. And guess what? They don't remember. Not a clue. So I spent two weeks restricting their use so that they remember/understand certain concepts (because I am convinced that the faster way eliminates the understanding of those concepts) but when it comes time to show me that those two weeks of by-hand work actually paid off? Goose egg! Now before I provide my suggested solution, let me talk about another situation: finding the standard deviation. "Well, I know we can find standard deviation on our calculators, but I make them figure out 1 or 2 by hand, that way they have a feel for what's really going on." I think this is so much baloney. Here's my issue. When it comes to writing a test with my colleagues, they never offer me an assessment question that they believe will really measure if the students really "got the feeling". In fact, when the test is said and done, I didn't have my colleagues who taught this way saying "See! Here is the question that my kids got right and your kids didn't. That's because my kids calculated the standard deviation by-hand!" I have yet to see a problem where students seem to benefit from 20 minutes of 1930's by-hand work. If anything, it just makes them hate your class a little bit. In the end, both of these scenarios boil down to writing high quality assessment items. In the case of the standard deviation, I have never observed that calculating it by hand helps students successfully describe the standard deviation as the typical distance of the data from the mean. But if you're going to really assess your students' understanding and not just their button-pushing skills, you'd better write an open-ended question that assesses precisely this concept. (AP Stats, 2007 #1 is a nice starting point.) When your goal is for students to be able to meaningful interpret this value, I'm betting you'll change how you spend your class time. And by-hand calculation probably won't be taking up that time. With p-values, I definitely need to up my game on my assessments. I need to write assessment items that test my students abilities to find a p-values without being able to press a test button on their calculator. This is a skill I value. There is TOO much magic happening with the technology. But instead of unrealistically forcing a by-hand calculation by hiding calculator functionality, I need to write creative test questions that require these kinds of skills. These questions aren't actually hard to write, I just haven't done so (simple example: provide students with a test statistic and they hypotheses and ask for the conclusion). Part of what I'm learning (ever so slowly, it seems) is that when students are failing to produce the kind of understanding I'm hoping for, I need to figure out both formative and summative ways to asses that concept more frequently. Because if I'm not forcing them to answer questions about a concept, they letting it slide out of their mind and replacing the space with SnapChats! "I'm spending an extra day on this topic so that students really understand it!" make sure you have an assessment item ready to see if that time paid off. I went to Back to School Night for my sophomore tonight. It is always fascinating to sit on the other side of the teacher's podium. My son has some great teachers this year. And a lot of them did a nice job telling us what to expect from the year ahead. My favorite bit was a teacher who talked about 2 requirements. He suggested two things that kids can't forgive you for if you're missing them. *Be enthusiastic for your subject. *Be enthusiastic about enjoying your students. There is a bit of crazy on this night. For one, there's lots of talk about point collection. Many teachers talk about difficult tests, but then reassuringly add that there are ways to offset low test scores. Apparently none of the parents are concerned that their child will demonstrate incompetence on tests as long as there are other ways to fix this loss of points. But this is not the place for an SBG lesson. The oddest thing about a Back to School evening (especially as an Honors parent) is all the serious warnings. "The pace is really fast and we have a lot of material to cover!" These all important warnings are inserted randomly through the evening. Sometimes in a serious tone. Sometimes apologetically. Other times defensively. And while I'm tempted to feel that the teachers need to calm down a notch (or two), I noticed that it is the parents who are feeding this beast. Indeed, the parents seem to want this. Many take copious notes. (Although the mom dressed to the nines and surfing her phone during the entire chemistry chat was nothing but hilarious. How much you want to bet her student is LESS addicted to his/her phone than she is?) The parents are attentive to every detail. They take down information like "Reading quiz every Friday!" and "Tutoring after school Mondays and Wednesdays!". They've got a 15 year-old honors student who apparently they don't trust to remember these words. Even though they're in the syllabus, on the board, and have already been played out for 4 weeks, parents are concerned that their child needs to receive this information. Again. In short, parents like this game. It is familiar--their school memories are probably about rigor and pace. And they want a competitive college for their child. So they don't actually want to hear that this is too easy. Hopefully this post might encourage a few to step back and look at some of the peculiar practices that are part of American education. Every culture has them. And I'm very thankful for the hard-working people who teach my kids. Attending the AP Statistics Reading is an exhilarating experience. A professional development experience like no other. The friendships I have made (and continue to enjoy) at this event are increasingly precious to me. As I left the 2015 Reading I had contradictory emotions. You have all these great conversations at the Reading. Ideas, rubrics, teaching frustrations, and statistical ideas are bandied about in a never-ending torrent. And as each new idea is tossed across a lunch table or over a late night snack, someone always has an answer. A clever idea. An instructional practice. And often ideas that I've failed to work into my classroom. There are amazing teachers at the Reading. And they work hard, teach well, and inspire their students to learn how think statistically at a very high level. Fortunately, as I processed the ideas of the week, I was able to transform my intimidation into inspiration. I realized that it's easy to hear people share their best ideas and forget that they also have areas of struggle and frustration. More importantly (because honestly, some of these people are simply rock stars in the classroom!) I can implement some of these ideas in my own teaching. FRAPPY's are awesome. They help students dive into the rubrics. I need to get organized and use them more often. Finding ways to incorporate multiple choice practice into my classroom is essential. "Making it Stick" is a book I should read. It has some awesome ideas for making learning last longer and be more durable. That is a fairly short list. But I generally try to only implement a couple of new things each year. I've already read "Making it Stick" and it has proved to provide ideas galore. In fact, I'm hoping to do a follow-up post focused solely on ideas from this book very soon. Many thanks to my fellow Readers for the inspiration! A crucial probability concept is independent vs. dependent events. A game played on the Jimmy Fallon show is a brilliant example of this concept. You can watch a sample here. My good friends James Bush and Paul Buckley first connected this Late Night fun with a statistics class. James and Paul designed a version of this game with Easter Eggs and light-weight confetti inside. But I decided that I needed to go all the way. So I prepared real eggs (8 hard-boiled, 4 raw) and we trotted outside to play. This messiness and fun seems worth it to me. The longer I teach, the more I am committed to giving my students mnemonic devices that really stick. After this lesson, when I want to remind my students about calculating dependent probabilities, one mention of an egg should do the trick. That seems well worth the effort. Besides, a little laughter is good for the soul! This fall I decided to skip to chapter 11 in Stats, Modeling the World 4e and start my year with data collection. I made this choice for two reasons. Firstly, my AP Instructional Planning Report showed that my students couldn't describe a bias correctly. This was my lowest score. Secondly, I have a number of friends who swear that this is the best way to start the year. They testify that this topic starts the year at the right place conceptually and it requires the high level of clear communication that the course requires throughout. I started the year with lots of reading from SMW4e. I wanted kids to realize that their book is very readable and is a useful resource. We would read short passages in class and frequently consult the vocabulary sections at the end of each chapter. I can already see that this paying some dividends, as students have commented about how well the text is written. I have also seen students consulting the book in chapter two, with no prompting from me. They have realized that this is a useful and amazing resource. I used the "Show Me the Money" activity from the latest CB module. If you haven't attended a CB workshop recently, I'm afraid that there is no way to share this resource at this time. It's a great activity where students try to guess the mean gross from the 2011 movie box office. Then students take a convenience sample (the movies they watched), a SRS and a stratified sample. The bias and the variability of these samples is discussed and contrasted. Doug Tyson did a great job writing this module. I did a number of predictable practices: discussions, a quiz, a crossword, a small experiment (heart rate change drinking caffeinated soda vs. not [but this was on an insane minimum day and was more fun than learning]). I enjoyed using the Just Checking feature of SMW4e, as well as the practice exam with multiple choice items. My best new idea of the unit was this document. We took a group test (groups of 4, solving 4 problems together). Predictably, after the assessment (which is meant to be formative, but does count for a small grade), I was brain-storming how to help them write more clearly. I realized they needed a side-by-side comparison of what they said vs. what they should say. I'm still grading their first test, but it appears that for some students this document helped. Students definitely had abnormally high anxiety about these introductory chapters. I don't know how much that is my fault. The wording of the rubrics is picky and communicating these complicated concepts is challenging. And my ability to adequately spiral these topics so that my jump-start can result in deeper learning remains to be determined. I guess I won't really know until I see the AP scores next July. Educational researcher Robert Marzano recommends that a power curve be used to evaluate a student’s current level of understanding. This curve is supposed to be an effective model for assigning a student a score on a 4-point rubric while assessed over time. The curve is supposed to recognize and reward growth over time. You can see in this help document 4 nice examples of the power law behaving as Marzano promises. However, in my experience, it turns out that the power law is a model for assessing student growth that has serious flaws. Fatal flaws. Here are the most egregious. The biggest problem with the power law is that when a student has a “whoops” and bombs an assessment, I give them a score of 1. However, if a 1 occurs in the middle of the curve, the curve will not adjust upward and the student becomes frustrated. I didn’t realize the problem until I had the same student come after class repeatedly to retake the same standard. My goal is that when a student does this, she is justly rewarded with a higher grade on that standard. However, she pointed out to me that because of the 1 she earned after the third assessment, her grade was not increasing. *You cannot assign a problem as worth less than 4 points. The power law will take this score to show a decrease in ability. Likewise, adjusting for difficult questions is unmanageable. *You cannot weight one assignment as more important than another. *If you test the same standard several times at once, there is no way to enter the scores. The best you can do is average the scores together and then enter that score repeatedly. *As some of my standards are not tested enough times for the power law to take effect, I have to use an average. But this only increases the cloudy confusion about how grades are determined. Some standards on the power law, some on an average. I am not giving up on grading by standards. I think in Fall I will attempt a new version of SBG that uses weighted categories. Frankly, I am content with neither of the two options I've heard on twitter. Neither taking just the latest score, nor taking just the highest score seem satisfactory to me. More on this later. 1b) Off campus students are much more likely to not participate in extra curriculuar activities than on campus students. Overall, it appears that on campus students are more likely to participate in 1 activity or 2 or more activities. 1c) With a large p-value of 23% > than any reasonable alpha, we fail to reject Ho. We failed to find evidence of an association between residential status and level of participation in extracurricular activities. 2b) As 3 women being picked would only happen 1.2% of the time by chance, it may be true that the manager did not use random selection. 2c) This is improper. The probability of picking a woman would stay at 1/3 the entire run of the simulation. But because we are sampling without replacement, the probability of picking a woman (or a man) changes with every selection. 3b) The average of 3 days will have a smaller standard deviation (10.5/sqrt3) and should be closer to the average of 120. So the school would be less likely to lose funding. 4a) Because income is skewed right, the mean income will be greater than the median income. Thus reporting the mean will be a more impressive figure than reporting the median. The median would be the better choice because it would more accurately represent the true center of a skewed data set. 4b) Method 1 will suffer from a large voluntary response bias. Alumni with low income will not want to participate and thus the estimate will be too high. Method 2 will be random thus less biased. While it will still suffer from a non-response bias, especially from those embarrassed by low-income, the estimate should be closer to the parameter. Still too low, but closer. With a p-value of 0.008 < 0.05, I reject Ho. I found strong evidence that the difference in purchase price of women - men > 0. 6a) y-hat = 4.92 (plug in 175). 5.88 - 4.92 = 0.955 FCR. Car A had a fuel consumption rate that was 0.955 higher than predicted for its length of 175. 6bi) The point circled should be (93, 0.955). 6bii) Car B has a FCR that is almost exactly the same as its predicted FCR, given its length. 6c) For Engine Size, the larger the engine size, the larger the residual in using length. Whereas for the Wheel Base, there appears to be no association between the length of the wheel base and the size of the residual using length. 6d) He should use Engine Size, because it will add extra value to his model. It shows that Engine Size increasing also increasing FCR. Whereas Wheel Base adds no new information to the model. [a #6 you can use BEBORE inference! Cool!]. 2. My especially prepared deck of cards. The theme song speaks for itself. For the cards, I begin with a tale of my upcoming weekend adventures. This year I claimed that I was going to play some poker with my buddies while we watched the Super Bowl. As I'm describing my upcoming gambling exploits, I'm opening up a fresh, sealed deck of cards. Then comes the hook. I offer to let students draw two cards. If they're both red, they get a nice bit of extra credit (this year plus 2 on their rubric scores!). One red card is a smaller amount of extra credit, but two black cards will result in a small reduction in your grade. As we've just finished a couple of very challenging assessments (CLT?! ), I have plenty of eager students to take the risk. One by one, they draw two black cards. Upon each of these unfortunate incidents, I sadly add their hame to the board with a negative number next to their name. By the fourth student, there is plenty of clamor to see the whole deck. I belatedly show them the deck--which is all black. I am called many names, I erase the victim's names from the board and pass out a bit of candy to ease their pain. Now we have an iron-clad example of a super low p-value! 8 black cards in a row is very unusual from a fair deck. HT: Roxy Peck first showed me this activity. I've modified it slightly. My prep work. A sharp utility knife opens up the bottom and you can slide out the cards and make an all black deck and an all red. Make sure you buy identical decks! A project for stats students analyzing statistics in the news. What's better than Golden Coral or Home Town Buffet? Well. Actually, everything, ever. But that's beside the point. The correct answer is: An AP Statistics SBG'ing Test Buffet! I'm in the middle of testing, so I might have more to report later. But here are a few observations. Students knew which topic they had the lowest score on and grabbed that topic first. Some of my students with high grades opted to take their one low standard and then they did a Normal Distribution problem because that is easy for them. Testing this way seems to have alleviated some of the end of the semester whining about grades. Everyone knew that today they have a chance to prove me that they know their stuff. We'll see if that lasts into next week (the week before finals). The number of students who are clueless about which standards to take is (thankfully) very small. As I said, everyone seemed to be very focused on their worst topic. Some students are a bit hesitant about picking a second. Overall, this seems like a fantastic way to finish up the semester. Next week we'll take one last chapter test (random variables) and the final exam will be all multiple choice. If nothing else, this means I won't have to grade FRQ's over the Xmas break! Next semester I want to try a test where half the test is the standard we just finished and the other half is a roll of a die to randomly determine an old, spiraled standard! This post made possible by Rachel at http://purpleprontopups.wordpress.com/ and Shelli at http://statteacher.blogspot.com. This post stems directly from their generous sharing. 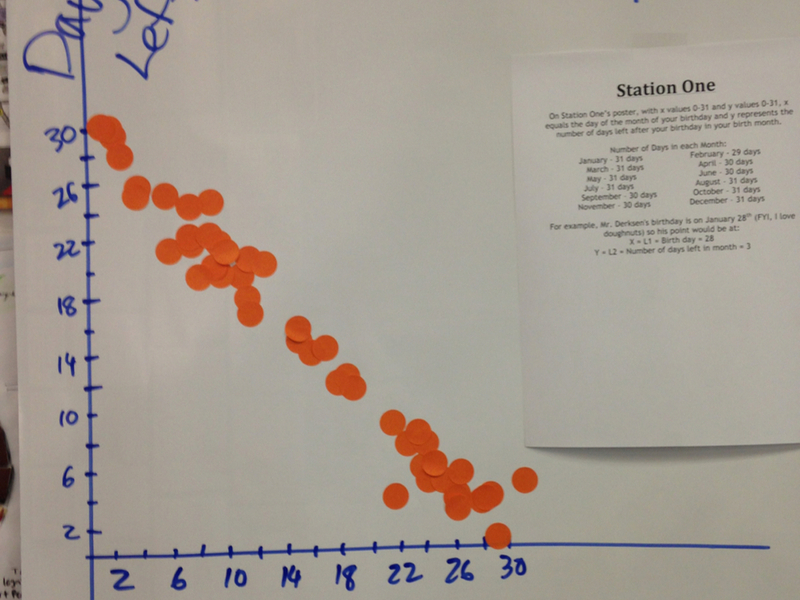 Data that had a variety of directions and slopes. 20 minutes of class time. Thanks to aforementioned blogs, I got a huge start on my activity. You can read about all 8 stations I used in this document. I ran the 8 stations for about 20 minutes at the beginning of each of my 3 AP stats classes. Note that these stations produced great 2-variable data. Anyone teaching lines of best fit could use these stations. This definitely includes the 8th and 9th grade CCSS on linear regression. A few notes about the stations to whet your appetite. While you would think that length of name and length of hair would have no association, it did! There was a weak, negative trend. But students quickly realized that this was caused by gender grouping. Cool! 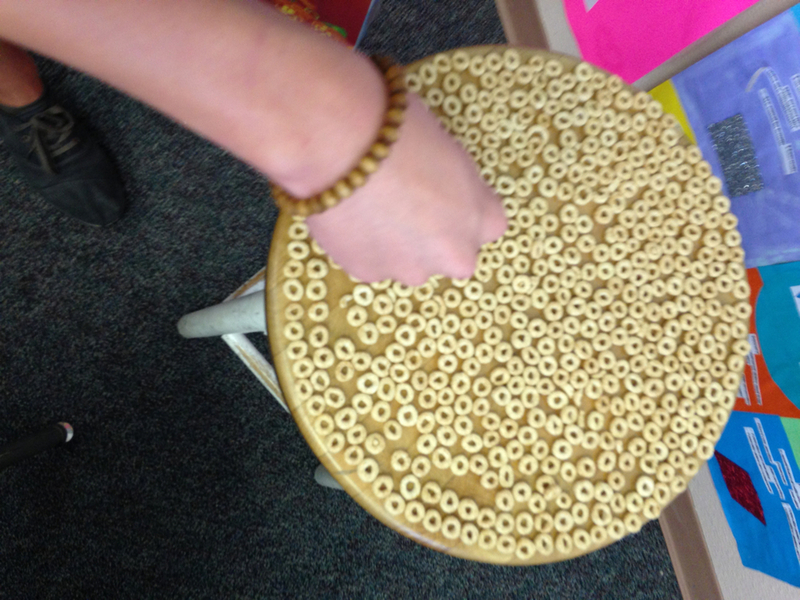 I had some students really have fun with cheerios. They made MASSIVE circles. One on my circular stool, then a second the width of the student tables. Since both of these circles were very close to a ratio of 3 and were much larger than the rest of the data [(26, 80) and (47, 149)], these points ended up VERY influential. When we removed them, the ratio of the diameter vs. circumference dropped to 2.3. With the influential points, the slope was a very satisfying 3.12. Fantastic example of influential points. Students made typos. And measurement errors. I let the students see these errors. And we talked about fixing and/or deleting them. I had non-influential outliers also. When students tied knots in the wire, some of them got goofy. But they were outliers in the y-direction and were not very influential. I was not demanding enough on forearm measurement, and thus we were not very close to the Golden Ratio! :-( That station requires accuracy! Overall, I couldn't have been more pleased. The data was real and interpreted smoothly. I lost NO time in my pace. I used the data over the course of several weeks and left the big graphs up for longer. Last week, I asked my Geometry students a very simple question. If any of them had any real memory for their Algebra 1 experience, it wouldn't have lasted 2 seconds. But they don't. They're a bunch of mediocre sophomores. Nice. Pleasant. I like them. But academically just not very impressive. I guided them to draw a line segment with a slope of 2/5 on graph paper. We drew something like this. Then I asked them to draw a line perpendicular to this line and figure out its slope. And because this class has memory skills that would make SpongeBob and Patrick look clever, I made sure we remembered what perpendicular meant. Then I set them to explore. There is one simple key to this brief lesson that I like. I asked a question instead of providing a (magical) formula. As I circulated the room, students asked me if their answers were correct. Most weren't. But they kept trying. And this was my moment of joy. A glimmer of perseverance in problem solving (CCSS mathematical practice #1). Just a bit, mind you. But it was there. They knew I wasn't going to bail them out immediately. Most knew they'd have to try again. And they did. And in the process of their trial and error, I think they absorbed the right answer more deeply than if I had given it to them. Dan Meyer has recently been discussing real world, fake math and relevance. I have no doubt that you could teach perpendicular slopes with a better (any!) context. However, my students were engaged. I posed a question. I asked them to hunt for a solution. They were curious, almost to a man. They tried and experimented and guessed. My geometry lessons need LOTS of help. But this simple lesson worked for me; my students were engaged. More on coordinate geometry soon. There was a cryptic comment on this handout for my 2013 exam walk through about the problems with running multiple tests. I had no time to elaborate, so I'll do so here. If you wanted to test if Froot Loops are uniformly distributed, one method you could use is to run a 1-proportion z-test (p = 20%) for each of the five colors. This has numerous problems. The biggest problem is the accumulation of Type 1 errors. Every time you run a test, you have (usually) a 5% chance of committing a Type 1 error. But now you ran five tests. So the sum results in a 25% chance of making a Type 1 error. The reason we need Chi-square is because it has the capacity to evaluate all five categories simultaneously and thus avoids this problem. Jessica Utts (the chief Reader in waiting) addressed this issue in her talk to the Readers. She discussed the problem of researchers running test after test after test until the find "significance". (This talk is posted on her page under Representative Presentations.) You can also see a humorous presentation of this idea by the brilliant XCKD. I'm over a month in. Here are a few thoughts about my further adventures in using Standards Based Grading in AP Stats. I've been grading my tests on rubric scoring for years. (AP Stats folks would recognize my EPI = 2, etc...) It is so awesome to NOT have to figure out how I want to convert 1-2-3-4 into 70-80-90. That is a time saver. I love it. I have to rewrite some of my assessments so that they are similar in length and difficulty. And I'm changing my file system. Now I need files that are organized by standard. With multiple assessments for each standard. Including enough assessments so that students can come after school and take even more. I was initially worried about AP questions that are very difficult and will produce mostly 1's and 2's. I think I'm going to call these problems "plus one" problems. After they are all graded, I'll add one to everyone's score. Hopefully that will make the assessment. However, a question like this raises a concern regarding the power law. More on that later in the post. And I what do I do with a 4 + 1 =5? I discovered the hard way that my school website makes sub-standards under a larger standard more confusing, not less (Easy Grade Pro recommends using sub-standards to simplify student communication). So I had to ditch this plan altogether. No more sub-standards. As I looked forward to my next "big" test (aka, a full period test), I began to fret. I couldn't figure out a way to get in all the new standards, old standards to retest and multiple choice into a one period test. Quizzes to the rescue! That next big test is over a week away. So I'm going to going to make sure and give two quizzes this week. They should take only 15 minutes each. I plan on reassessing one old standard and assessing a new standard for the first time. Overall grades feel fine so far. I set the bar for 3.33 average for an A. That is feeling just right. Likewise with 2.75 for B's and 2.0 for C's. My biggest mental dilemma right now is the power law. As I retest each assessment, a power curve will determine the student's current level of learning. My concern is that the free response questions vary in difficulty. So if I end with a fairly straightforward question, the power law will determine that the student level of understanding is high. If I choose a more challenging question, the scores will be lower. In theory, proficient (level 2) should be the same on every assessment. But in practice, that seems kind of tricky. And my textbook test bank has questions that add even more uncertainty. Part of me thinks that an average would be more fair, where you drop the lowest score to adjust for growth over time. But as soon as I type this, I see more flaws. For example, students can forget topics and not finish strong, but then drop that score. In short, I think I have yet to give enough assessments to see the full effect of the power law. I have tested the first topic twice. And when the power law has only two scores, the second score becomes their current score. Time will tell. I read Wiliam's Embedded Formative Assessment this summer. (Thanks to my awesome principal, Dr. Kelsen, who buys me books if I say please!) I'm increasingly convinced that formative assessment is where its at, if you really want to improve student learning. In fact, my current belief is that if you start paying attention to student learning, you will end up on a path of formative assessment, retesting and eventually, Standards Based Grading. But I digress. I'm not going to write much on this topic. You can read about these methods all sorts of places. I mostly wanted to share the document I made for my department. I challenged my department to take the 350 answer challenge. That is, I challenged them to listen to their students give 10 answers, per student, per week. Band teachers have all the luck. Every time their students play, they hear hundreds of "answers". Most of us have to work much harder to listen. I was quite impressed that some of my colleagues were willing to try the Red/Green classroom pace idea. They bought red and green solo cups. Every 2 students have a set of cups. If the lesson starts to get confusing, the students switch their green cups to red. Once there is too much red in the room, the teacher realizes its time to stop and see what the misunderstanding is about. Finally, a shout out to the crazy folk on Twitter who keep discussing this book all summer, especially on Wednesday nights for an hour. I couldn't always join, but you all are very motivating. Here the file. Let me know what questions you might have. This year in my AP Stats classes I'm going to use Standards Based Grading. Nothing I've ever tried in my classroom has ever elicited so much curiosity, so I thought I'd try and blog about it. To begin this process, you have to chose a list of standards. My friend Drew who teaches Spanish and uses SBG tells me he changes his list every year. That relieved some pressure. It's not as if this the Perfect-List-of-Standards-for-All-Time. The indented standards are sub-standards. Their scores will be averaged together to provide the overall standard grade for that topic. Most standards will not be graded on averages, however. They will graded using a power curve. This is the recommended function by the researcher Marzano. This curve is built into the program Easy Grade Pro, which I will be using. To see an example of how the power law works, take a look right here, towards the bottom of the page. I will grade projects and multiple choice tests on an average instead of a power law, but more on that later. I will grade every item according to a 4 point rubric. As AP Stats already uses a 4 point rubric this works out rather well. (Note: I am departing from Marzano's system. 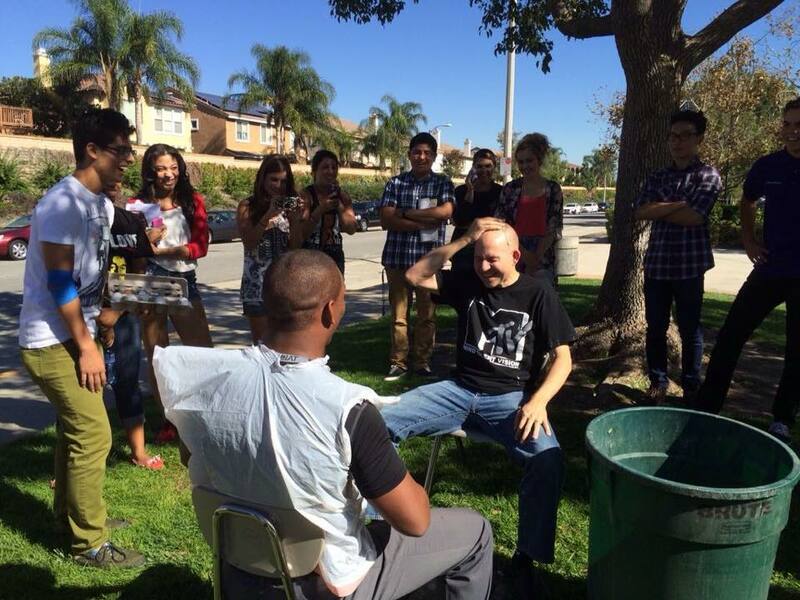 He views a 4 as a score that is only given when a student goes above and beyond.) Every standard will be assessed multiple times. As the year progresses, the power law will determine the student's true ability on each standard. Then the standards are all averaged together (some with double weight. I can weight in EPG as I'd like. I'm sure I'll be changing that over the years) and an overall score from 0 to 4 is determined. I've currently set 3.33 as the bottom of the A's, 2.75 for B and 2.0 for a C. I am very confident about the 2.0 standard for a C-. When students practice for the AP exam, I always tell them that they have to average 2's on the rubrics if they're going to pass. The actual score needed to pass the AP test is usually lower than this, but in my classroom, students who score 2's pass the AP test with a 3. There is so much more to say, but this blog post is already long. You can put questions in the comments, email, twitter, or wherever. I'll try to keep this going. *Quant (4/5)	Students can graph, describe and compare quantitative variables. III Design	Students can apply and analyze methods for surveys, studies and experiments. *IV Prob	Students can calculate and explain probabilities, including random variables, normal calculations and the binomial model. *V Prop	Students can perform and interpret inference for proportions. *VI Mean	Students can perform and interpret inference for means. VII Groups	Students can use and interpret chi-square and slope inference. Apply	Students can apply, analyze and describe real world usage of statistics. *MC	Students can apply statistical concepts when asked in a multiple choice format.